In what seems to be a monthly affair where legislators have something controversial to feature on the media, it's has been a war of words between Senator Jibrin and Dogara over an alleged budget padding. Once upon a time, Senator Melaye and Tinubu were in the lime light over issues that hasn't changed the predicament of Nigeria for good now for weeks there has utterances that suggest that there's more to what meet the eyes. In the mean time, APC has waded into the matter and allegedly restricted parties involved from unguarded statements or action as they resolve the matters behind the scene. 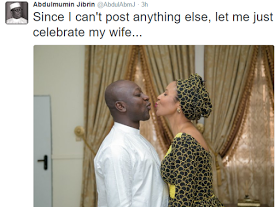 In a recent message on senator Jibrin Twitter timeline, he had something special to share with the world despite the APC order.